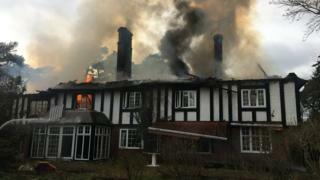 A fire that destroyed an early-1900s house in Henley-on-Thames is being treated as arson. About 40 firefighters from six crews were called to the blaze in Gillotts Lane, opposite Gillotts School, at 15:25 GMT on Tuesday. They brought the fire under control while school staff kept pupils and vehicles away from the area, the fire and rescue service said. The house was empty at the time and an investigation is now under way. Crews remained at the scene throughout the night, and the fire has now been completely put out.